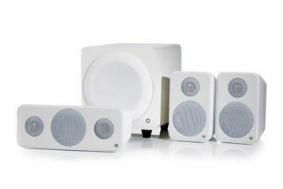 Monitor Audio adds Vectors to its AV speaker range | What Hi-Fi? There's a wall-mounting satellite speaker, the V10, at £150/pair, the £100 V20 centre chanel unit and a compact 100W subwoofer, the £250 VW-8. The V10 and V20 cabinets are made of high-density moulded polymer with a 'soft-touch' rubberised black skin. The front baffles are MDF, which is coated in a high-gloss black lacquer to match the majority of flatscreen TVs. A high-gloss white lacquer finish (pictured) and walnut wood grain effect finish are also available. Although the Vector V10 is designed primarily for use with the V20 and VW-8 in a home cinema set-up, Monitor Audio claims its "unusually deep bass makes it ideal for stereo sound around the home". It uses a 4in MMP II (Metal Matrix Polymer cone) bass driver and a 1in gold C-CAM (Ceramic-coated aluminium/magnesium) dome tweeter to provide a frequency response fom 65Hz to 30kHz. The Vector V20 centre speaker can be used horizontally or vertically for home cinema duties, or as a left/right satellite speaker in stereo or multichannel set-ups. MA says it has the same tonal characteristics as the V10, but with the extended bass response necessary for accurate reproduction of movie dialogue. And for the additional bass required for home cinema duties, the VW-8 subwoofer has an integral 100W A-B amplifer and 8in driver housed within an MDF cabinet. If that's not sufficient, the Radius HD370 subwoofer in matching black, white and walnut finishes can be bought for £500. The new Vector range will be available from July.